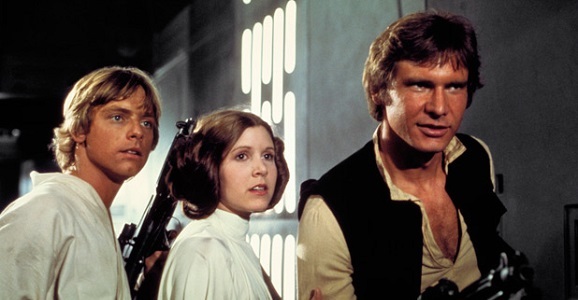 Are Harrison Ford, Carrie Fisher, And Mark Hamill In London For Star Wars: Episode VII? Every day that passes means we’re all a little bit closer to next year’s release of J.J. Abrams’ highly anticipated Star Wars: Episode VII, and that in turn means we’re even closer to the production start date for the long-gestating next entry in the Star Wars saga. And if we can extrapolate once more, it means we’re that much closer to finding something out about the movie that isn’t just a rumor, specifically whether or not Mark Hamill, Harrison Ford, and Carrie Fisher are seriously going to appear in the trilogy or not. For now, though, we’re playing Giant Freakin’ Detective and connecting some fairly obvious clues. Fortunately, Entertainment Weekly did some of the dirty work for us, which is good since my private detective license didn’t arrive in the mail yet. They’ve rounded up examples placing Ford, Hamill, and Fisher all in the city of London, the home of Pinewood Studios, where much of Episode VII‘s production will take place. Sure, it’s possible that three of the most recognizable actors on the face of the planet can all be in the same city as the film that they’re supposedly starring in without it meaning anything, as coincidences are as common as midi-chlorians. But I don’t think we’d be hearing about their mini-vacations in such a mysterious manner. 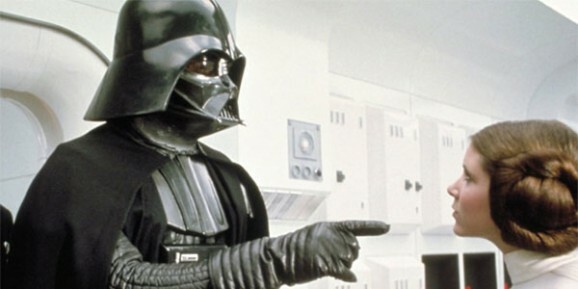 In George Lucas’ original Star Wars trilogy, the rebels go at Darth Vader and his cronies in a variety of ways. There are full-frontal assaults, sneak attacks, they even send his secret son after him. One thing they never tried, however, was to take a baseball bat to him. That could have worked. 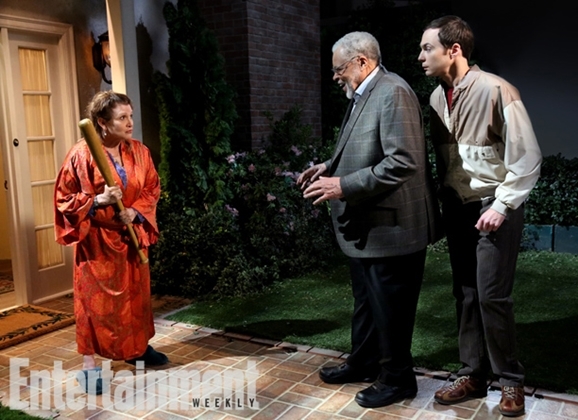 That’s essentially what looks to be happening in this first photo from tonight’s episode of the hit CBS sitcom The Big Bang theory, which reunites Princess Leia’s Carrie Fisher with the voice of Vader himself, James Earl Jones. The premise of the episode is that the Big Bang gang, for the first time ever, is unable to procure tickets to Comic-Con. We’ve all been there. In a fit of bitterness, Sheldon (Jim Parsons) decides to hell with that noise and starts his own competing convention. When you tackle a project like that you need some star power to make people stand up and take notice, so Sheldon sets his sights on procuring Jones as a guest. This, as you probably imagined, leads to some mild shenanigans, and at some point, their crazy night involves winding up on Carrie Fisher’s doorstep. 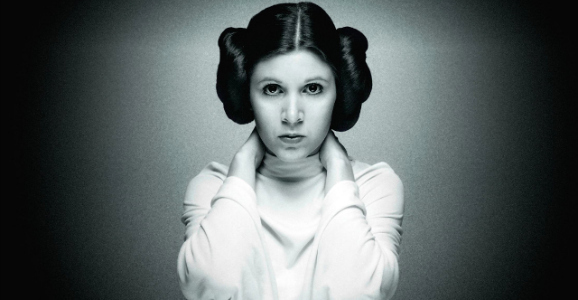 Long before we see Carrie Fisher reprise the most famous role of her career, as a certain Princess from Alderaan in Star Wars: Episode VII, we’ll have a chance to see her on the small screen. She’ll appear on FXX’s comedy Legit, which I had actually totally forgotten even existed, and the hit CBS’s sitcom The Big Bang Theory, which I just try to ignore. 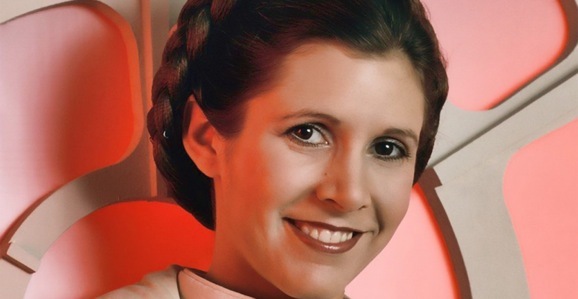 On this last adventure, she’ll be accompanied by another veteran of that far, far away galaxy, the voice of Darth Vader himself, and current shil for the cell phone companies, James Earl Jones.